I'm up, getting ready for my day. I make sure my social media posts are all lined up to go, and that any updates or text I want to use has been proofed and is ready to be posted. (Last night I made sure my YouTube video was updated and the link was ready for use. I also made my graphic for today so I can have it ready to roll out on my phone throughout the day.) I check my email to make sure no craziness has begun...yet. I begin drinking my goal water intake for the day as well. I'm out the door driving to see my patients at a tempo Voice Center. This is my company and I work hard daily to make sure I accurately represent my brand. I have looked at my patient load the night before on my scheduling software, to make sure I have an idea of anything I need to be extra prepared for. At this point in my clinic life, I have a good idea of what to expect from patients, so those butterflies don't really happen anymore, but they used to for sure! I am constantly surprised, however, that I am truly not only in the business of speech-language pathology, but people. More drinks of my water, as I try to do what I tell my patients to do. This way I know what they're experiencing. I pop my lab coat on, fire up my computer and make sure all my equipment is working. I open up the chart for my 8am patient, and determine what we did last session so I have a good idea of where to go next before he even walks through the door. I look at goal progression percentages, and what worked well last time. I want to make sure he is still getting his concerns addressed. My first patient arrives. I am seeing him for help with his muscle tension dysphonia. He's a singer, so I get to use my piano to work on straw phonation in a singing context to transfer optimal laryngeal coordination into a performance context. I love being able to sing for a living. I am not singing for my supper, but I get to enjoy music when I treat my patients. How awesome is that? Chart. I have 5 more patients scheduled after this before I take a lunch, so I buckle down and prepare for efficient, quality work. Break for water sip. I see a transgender voice client to help her work on more feminine speech which better reflects the gender she identifies with. Today we're working on feminine versus masculine character dialogues found in Voice in a Jiff: Hospital, Clinic or SNF. Chart and update goals. I see an adolescent patient for vocal nodules and compensatory maladaptive vocal behaviors. She is almost ready for discharge as she is making good progress with a combination of Casper Stone Confidential Flow Therapy and activities out of Voice in a Jiff: Pediatric Edition. Chart. I see two back to back evaluations where I use videostroboscopy and behavioral/acoustic measures. One patient presents with what appears to be unilateral vocal fold paresis and the other has vocal fold scarring with adynamic segments. Both are complaining of vocal fatigue and hoarseness. Chart, and create picture reports from the strobe exams. Fax results to referring physicians. I then finish up before lunch today with a rehabilitation session for a patient with unilateral vocal fold paralysis. She has received an injection into the paralyzed vocal fold and is now trying to make the most of it with resonance and breath work. Chart. Whew! I finish up charting my 6th patient, and I grab a quick bite to eat. Today it's a yummy salad with chicken, baked potato and sweet tea. I need a pick me up, ya know? I eat pretty quickly these days, as I try to get my clinic work finished so I have time for other things....I like to joke with my husband that I only eat because I know I have to fuel my body. I see my last patient to help her improve coordination of her vocal subsystems in the presence of age related vocal fold bowing/atrophy. With her, I'm using Lessac Madsen Resonant Voice Therapy and Stemple's Vocal Function Exercises. It's important as a voice specialist to have many tools in my box to pull from so my treatment is evidence based and patient specific. I finish charting remaining loose ends from the patients earlier today, as well as chart for my 12:45 patient. I sign off on my notes. I then can focus on blogging and product editing. I try to always be planning or proofing something. I return phone calls from the morning, which usually include moving patients around, rescheduling things, giving information about my services. I also use this time to take care of any planning I need to do regarding my private practice with appeal writing and billing issues. I also keep track of who I saw today, what codes I billed and who no-showed. I'm home and dinner begins with my family, with keeping the house picked up and managing my home life. I know you can all relate. It's hard to juggle it all. You must make time for yourself and your family, or you will burn out. Tonight we are having spinach salad, smoked BBQ chicken and baked sweet potato slices. I dressed the slices in coconut oil, sea salt, cinammon and black pepper (shout out to my grad school buddy Madeleine for this suggestion) Yum! I'm even grabbing a Holy Kombucha in the Blood Orange flavor, as I'm currently loving this right now also. Everyone's in bed, I can work on products, social media and blogging again. Tonight I make sure my newest product (hint, it's Fall themed!) is coming along and purchase some more clip art to add to it that I feel will make it more enticing and usable. I then finish a Continuing Education course I'm taking online about Vocal Function Exercises from Medbridge. Stemple has just described the "Power" exercise of the 4 step program with video examples and troubleshooting. 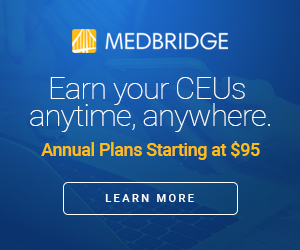 Did you know you can get unlimited CEU's there for $95 per year? 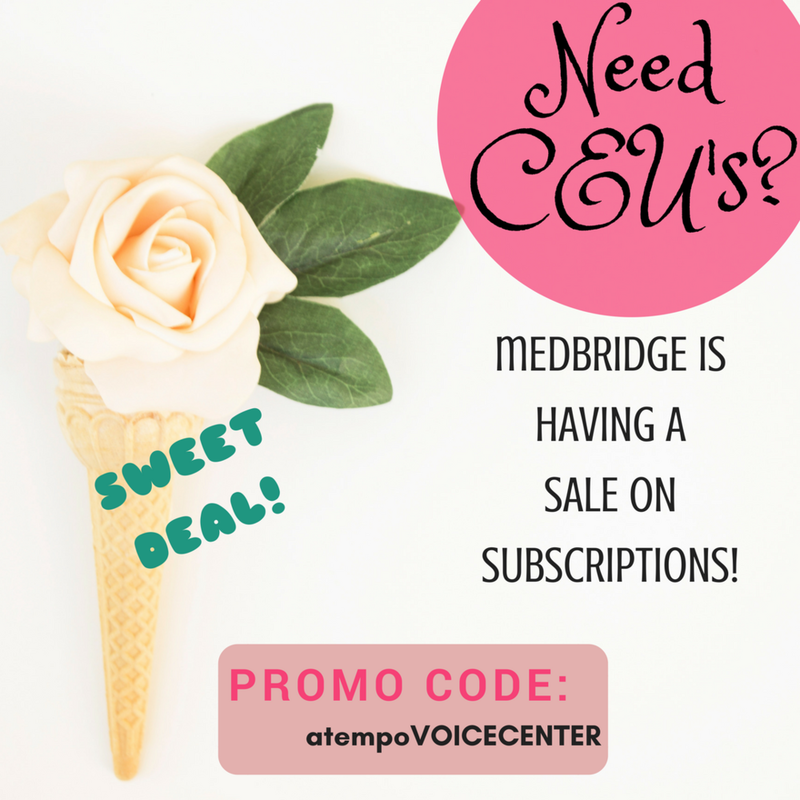 Anyone who is crazy-busy like me can take advantage with the promo code: atempoVOICECENTER to get this special pricing too. After I finish this course, I make sure to log it in my CEU folder so I keep track of yearly numbers. I get my work bag ready for clinic tomorrow. Still trying to get my last sips of water in, I head for the shower and crawl into bed. I hope you enjoyed reading about the things I do as an entrepreneur and a voice SLP. I see a variety of different pathologies in my clinic, and love trying to be a problem solver. There is no easy way to do things, but I prefer working for myself any day of the week because I am my own harshest critic and sometimes I can really feel proud of my accomplishments. With great responsibility comes great reward.